It may sound cliche, but “less is more” and “what you see is what you get” are perfectly descriptive of this clean and refreshing salad. Layered with citrus, briny shrimp, sweet onion, and creamy avocado, each ingredient hits the right spot and unites in a light and lovely summer lunch or salad course. 1. Salt the onion slices and place in a colander in the sink or over a plate for 20 minutes. Rinse with cold water and blot dry, then toss the slices with 1 tablespoon lime juice. 2. Heat 1 tablespoon oil in a skillet over medium-high heat. Season the shrimp with salt and pepper, add to the skillet, and cook until colored on both sides and cooked through, 3 to 5 minutes, turning as needed. Transfer to a plate. 4. Cut away the skin and pith of the grapefruit, then cut away the membranes and seed the segments. 5. 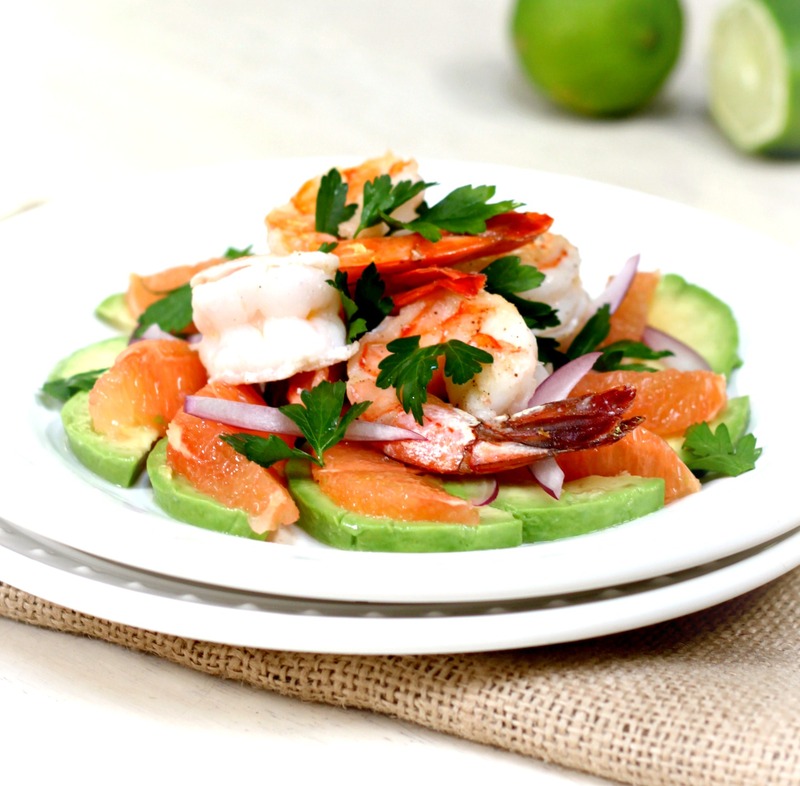 On individual serving plates, layer the avocado, grapefruit, onion, and shrimp. Drizzle with olive oil and a squeeze of lime juice. Season with salt and pepper and garnish with parsley. Serve immediately. This is THE cutest and most adorable salad presentation I’ve seen in a while! Gorgeous – my favorite summer flavors! ps We leave for Kauai Thursday and I will find your ingredients in the Farmers Market. Lucky you! Have a wonderful trip! Yummy, like deconstructed fruity guacamole.